If you plant pumpkin seeds, you’ll get pumpkins. If you plant tomato seeds, you’ll get tomatoes. If you work hard, you’ll get results. If you don’t work at all, you’ll get nothing. If you keep reading and learning, you’ll have a fertile mind for years to come. If your level of knowledge stagnates for too long, you’ll soon be left behind. If you are encouraging and generous towards others, people will say nice things about you. If you are mean and surly, they won’t. If you invest your time in activities that will benefit you in the long-term, you will have a better future. If you only think about today’s level of happiness, you will only be happy today. 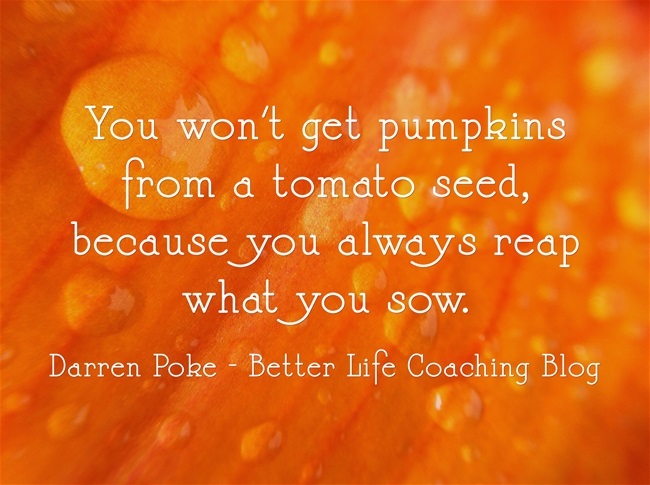 I know that it seems obvious, but sometimes we all need reminding that we reap what we sow. It’s not karma, it’s called consequences for actions and there is no avoiding it, so please be careful with what you are sowing. Because you won’t get pumpkins from a tomato seed.